Economic concentrations of REM are generally hosted in alkaline igneous rocks and carbonatites. In a dramatic move, China announced last year that it will further reduce exports of rare earth minerals (REMs) by 10% in 2011. The decision sent shockwaves across the industrialised world as world manufacturers are heavily dependent on China for these minerals, which are essential for making a range of sophisticated electronic goods, such as TVs and PC monitors. What compounded the worries was that China enjoyed a virtual monopoly, providing 97% of the world's supply of these minerals. Beijing’s decision was strategic in nature. In July, the People’s Daily published an article by Li Bing, an international strategy expert of the Central CPC School. He asserted that poor China should no longer sell its valuable resources cheaply to capitalist countries and declared that REM exports “must be gradually reduced and, ultimately, stopped”. By August, the Chinese authorities announced reductions in export quotas in the second semester by 72%; later, in the first round of export quota distribution for 2011, it cut them by another 11.4%. In September, China completely halted exports to Japan; in October, supply shortages were felt by industry in Europe and the USA. “The market did not hesitate to react to the reduced supply with a sharp price rise: most rare earth products appreciated by a factor of 1.5–4; some of them, by an order of magnitude or more,” say analysts of METALResearch. 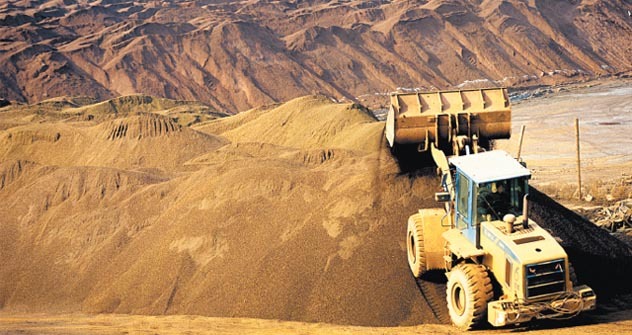 Russian industrialists should become proactive in developing strategic rare earths industry. Beijing’s unilateral quota triggered a hysterical reaction and also sparked a search for alternatives. India has already declared its readiness to export REMs, but it has only some of the rare earth metals supplied to the global market by China. India needs serious investments and technologies, including ones aimed at ensuring environmental safety of production facilities. The REM crunch, however, may prove to be an opportunity for Russia. Presently, there is practically no REM production in this country; rare earth metals are mostly produced as a by-product. In Northern Russia, for instance, the Lovozersk integrated mining-and-processing plant mines loparite ores (which contain a wide range of REM: tantalum, niobium, zirconium, lanthanum, cerium, etc.) and the Solikamsk Magnesium Plant (SMP) processes concentrates of these. But these facilities focus on magnesium production; to them, the rare earth business is merely auxiliary. Yet, in terms of explored reserves of REM, Russia holds the second place globally (about 30%); in terms of anticipated reserves, it holds first place (5.2 million tonnes). A good example is the Lovozersk deposit in the Murmansk Region (in Northern Russia). “It consists of three main minerals in about equal shares,” says Alexandr Samonov, a researcher for Institute of Geology of Ore Deposits, Petrography, Mineralogy, and Geochemistry of the Russian Academy of Sciences. “Besides loparite, the triplet includes eudyalite, an exceptionally rare mineral, which, outside the Kola Peninsula, is found in small quantities only at two locations in the world. For the production of rare earths, it is much more attractive than loparite, as the content of REM in it is 2–3%, i.e., twice that in loparite. Ore reserves that can be surface mined are estimated at 80 million tonnes even now. The second gem is the Tomtor deposit in Yakutia. REM content in its ores reaches a phenomenal 12%. Moreover, its proven reserves amount to 150 million tonnes, while possible reserves virtually exceed all the rest of the world’s reserves combined. Finally, there is another quite promising source: Apatite ores have been mined on a massive scale on the Kola Peninsula to produce phosphorus fertilisers. Comprehensive processing of the apatite raw material might produce approximately 40,000 tonnes of rare earths a year. REM production facilities in Russia are, however, concentrated in the hands of a few Russian entrepreneurs, who have been in no hurry to invest in developing the sector. SMP and the Lovozersk IMPP are controlled by Suleiman Kerimov’s Sylvinite. Apatite is controlled by the Fosagro holding company, which has shown no apparent interest in REM. However, the conditions have changed. Unlike fertilisers, REM are exceptionally expensive and are appreciating by the day. Russia can make good use of the window of opportunity opened by China by leveraging its mining capabilities and associated infrastructure. Moreover, supplying semi-finished products to developed countries that face crunch might constitute a good starting point for establishing the advanced stages of the rare earth production chain in the RF and for spurring production of innovative goods. Russian industrialists should become proactive in establishing a strategic rare earth industry. Our collaboration in this field has also potential. REM include scandium, yttrium, lanthanum and another 12 lanthanides, cerium being the most widespread. REM are found in nature in dispersed form. They are present in hundreds of minerals, while not more than 50 are of any industrial significance, and only two — bastnäsite and monazite — are mined on any significant scale. As a minor admixture, REM often play a decisive role in determining the key application characteristics of industrial items. In metallurgy, REM are coming into ever increasing use in the production of cast iron, steel and non-ferrous alloys. It is difficult to overestimate the role of REM in glass production, where cerium is used. Nearly the entire range of REM is used in laser manufacturing. In the nuclear industry, they are added to control rods to slow down the reaction, as well as to special radiation protection coatings. For several decades, REM have been used to produce catalysts, primarily for the oil industry. Significant quantities, above all of samarium and neodymium, are used in manufacturing permanent magnets. One of the most promising areas involving REM is the growing industry of electric and hybrid car production. The Toyota Prius is a classic example. The design of the latest model includes over ten kilograms of rare earths (mostly lanthanum and neodymium) — in the batteries, catalysts and metal alloys. Another innovation topic is use of rare earths to produce solar batteries.